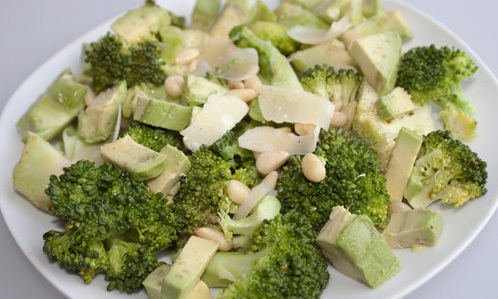 This warm salad is quick, easy, nutritious and tastes delicious! Prepare the broccoli by chopping the florets at the stem and also then slicing the stem thinly. Steam the broccoli until soft and bright green. Whe ready put the broccoli ina bowl. Add the butter until melted, or the olive oil. Add the chopped avocado, pinenuts, shaved parmigiano reggiano and salt and pepper to taste. Serve with your protein source of your choice (some good protein choices examples: cooked pastured eggs; cooked organic and pastured chicken breast meat; soaked and well cooked lentils etc- all depends on what kind of protein you would like to go with it! ).